Military veterans condemned Ohio Democrat Richard Cordray, a current candidate for governor, in a new ad for his comparisons of the Trump administration and Republicans to Nazis. Cordray twice made the comparison during campaign events. 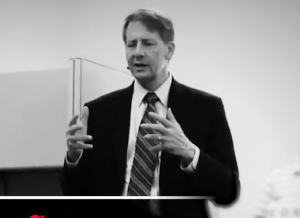 The ad, released this week by the Ohio Republican Party, shows World War II veterans Vincent Francioli and Bill Herdman calling Cordray's rhetoric "100 percent wrong." "Richard Cordray is not capable of governing the state of Ohio," Herdman said. "A leader doesn't say anything like that," Francioli said. "You don't go out and compare the White House with Nazi Germany," Herdman said. "That's absolutely, 100 percent wrong," Francioli said. "Richard Cordray needs to apologize for that sort of rhetoric," Herdman said. The Cordray campaign has said he regrets making the comparison, claiming he was only repeating others' comments. A coalition of three elected Republicans who are also veterans–Perrysburg City Councilman Haraz N. Ghanbari, Franklin County Auditor Clarence Mingo, and Franklin County Auditor Brian Stewart–have all called for an apology from Cordray. "Richard Cordray owes the people of Ohio, and especially our veterans, an apology for his hateful comparisons of Republicans to Nazis," Ghanbari said. "After hearing the words of WWII veterans Vincent Francioli and Bill Herdman in this ad, I am compelled to speak out and hold Richard Cordray accountable." "Today I am proud to join two of my fellow veteran elected officials – Franklin County Auditor Clarence Mingo and Pickaway County Commissioner Brian Stewart – in launching a grassroots effort to inform fellow veterans and voters across the state of Cordray's remarks," he said. "We will knock on doors, make phone calls and collect signatures to keep the pressure on Cordray until he does the right thing and apologizes." Mingo called comparisons such as Cordray's "despicable," noting they undermine efforts to promote civil discourse. "Comparing anyone to Nazis is despicable and undermines all efforts to bring our current political climate back to a place where civil discourse is the norm," Mingo said. "It is my sincere hope that Richard Cordray heeds the words of these great WWII veterans and apologizes for his remarks." Stewart added Cordray should learn from Ohio's veterans, even those he disagrees with politically. "Richard Cordray has a lot to learn from our veterans and we look forward to providing him with an education," Stewart said. "The people of Ohio and our veterans do not deserve to be labeled as Nazis because Richard Cordray disagrees with them politically. Between now and November 6, we will make sure that veterans and voters across the great state of Ohio know what Cordray really thinks about them." Cordray, the director of the Consumer Financial Protection Bureau during the Obama administration, is running against Ohio Attorney General Mike DeWine (R.) in November to succeed incumbent Gov. John Kasich (R.).